It was hard to innovate without disrupting the product. Using AWS, we can spin up environments as needed to support development. HeartFlow is a medical technology company redefining the way heart disease is diagnosed and treated. Its non-invasive HeartFlow FFRct Analysis uses deep learning to create a personalized 3D model of the heart. Using this model, clinicians can better evaluate the impact a blockage has on blood flow and determine the best treatment. Cardiovascular disease is the world’s leading cause of death, taking more than 17 million lives each year. The most common type is coronary artery disease (CAD), which reduces blood flow to the heart, causing chest pain, heart attack, and death. Clinicians need to know if and where there is a blockage, and how it is affecting blood flow. This helps them choose the best treatment pathway for the patient, such as medical management, stenting or bypass surgery. Doctors often order a diagnostic coronary angiogram for a patient suspected of having CAD. This invasive, expensive, and potentially risky test is often unnecessary. More than half of patients who undergo the test have no significant blockages, and the procedure can be associated with bleeding, stroke, major blood vessel damage and other serious complications. HeartFlow has developed the HeartFlow FFRct Analysis, a first-of-its-kind non-invasive technology that helps clinicians diagnose and treat patients with suspected CAD. It provides clinicians with insight into the extent of CAD and its effect on blood flow. This helps them design a definitive, personalized treatment plan for each patient and reduce additional testing. Data from a non-invasive coronary CT angiogram is securely uploaded from the hospital to the cloud. HeartFlow uses deep learning to create a personalized, digital 3D model of the patient’s coronary arteries. HeartFlow’s certified analysts make any necessary corrections to the model. Then, the HeartFlow Analysis uses machine learning and computational fluid dynamics (CFD) algorithms to solve millions of equations regarding the blood flow. The resulting HeartFlow FFRct Analysis shows how blockages are affecting coronary blood flow and is provided to the healthcare team via a secure web interface. Delivering timely results requires massive processing power. As HeartFlow grew, technical requirements threatened to outstrip the capabilities of its infrastructure, which consisted of physical blade servers collocated in vendor facilities. To avoid investing in managing hardware, which would take focus away from product improvements and limit growth, HeartFlow transitioned its entire infrastructure to Amazon Web Services (AWS). HeartFlow uses a wide range of AWS services. Amazon Simple Storage Service (Amazon S3) stores the data the platform ingests and generates. Amazon Elastic Compute Cloud (Amazon EC2) handles processing throughout the platform, including advanced CFD modeling. The company uses Amazon Simple Queue Service (Amazon SQS) to schedule compute jobs via a custom-built application, including triggering the CFD and imaging pipelines. It also uses the AWS Lambda serverless compute service to translate Amazon S3 notifications into Amazon SQS messages. Amazon Route 53 is used as a highly available and scalable cloud Domain Name System (DNS). 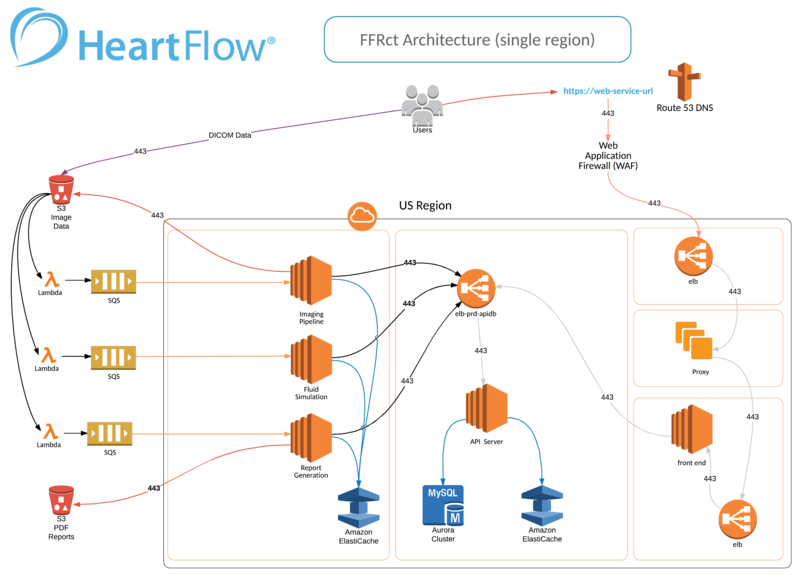 To broadcast notifications for multiple, region-specific workflows and DevOps functions, HeartFlow uses Amazon Simple Notification Service (Amazon SNS). The company also uses multiple Amazon Virtual Private Cloud (Amazon VPC) accounts for segmentation between development, production, and management environments. In addition, HeartFlow relies on Amazon ElastiCache to handle session information for customers accessing the platform. When receiving data from other regions, HeartFlow must keep personal health information (PHI) in the country of origin and recombine it later when generating the final analysis. HeartFlow uses the Amazon Aurora managed database service to keep track of this process and meet country-specific data-protection requirements. Moving to AWS has given HeartFlow the performance it needs to continue its rapid growth and improve its product. “We are achieving significantly faster modeling and CFD computations since moving to AWS,” says Kamal Kharrat, senior director of DevOps at HeartFlow. “More processing power reduces the computational time of our algorithms, thus making turnaround times faster.” The environment is highly stable, enabling HeartFlow to serve its global user base without interruption. Prior to adopting AWS, HeartFlow often faced challenges in managing job queues as demand increased. Now, with the ability to scale on demand, HeartFlow can handle any amount of growth and manage uneven workloads effortlessly. AWS also supports the company’s international growth plans. “Using AWS, we can deliver across regions with one set of technologies, keeping our team nimble and reducing the technical skills we need, to be effective,” says Kharrat. Moving its platform to the AWS Cloud will enable HeartFlow to bring its life-changing innovations to more patients in more places. To learn more, visit aws.amazon.com/health/healthcare-compliance/.